1. In a time in which the term "operation" principally means dead bodies, sectarian violence and such, an "operation" by the Yes Men is certainly a beautiful thing. These guys are just about the closest thing to a hero I have. 2. Pardon my cognitive dissonance, but I'm suffering from some sort of political vertigo or lumbago or embargo or something...Martin Chavez and I agree on something. A few months back some of us noticed that Bill Richardson appeared down in Las Cruces and waffled bigger than IHOP on the issue of cockfighting, saying "'I have not made up my mind on that". 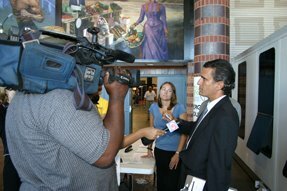 Now, Mayor Chavez appears before an animal welfare conference and brings up Big Bill's cockfighting waffle (which, yes, would be an excellent name for a punk band and alot of other things) as a stumble to Richardson's presidential aspriations. 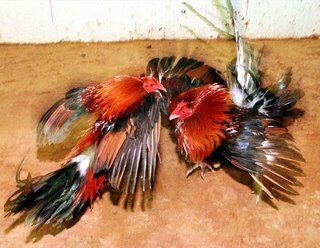 "You can't be president of the United States if you think cockfighting is a good thing," Chávez said. Of course having Feudal Prince Marty say that to an ANIMAL WELFARE CONFERENCE is classic Marty, as he prefers the political slam dunk when only players from his team are on the floor, but I'm really glad he brought it up, somewhere. I still belong (and I use the word very loosely) to a near-moribund Yahoo Group called "Bill Richardson for President". When the cockfighting waffle was brought up there months ago, the Richardson faithful present pooh-poohed the importance of Big Bill's non-stance. Now Marty has elevated the self-esteem of those who do think the non-stance matters. Am I wrong to tie my self-esteem to what Feudal Prince Marty thinks? Is there a rather large potential psychological risk here? Probably. But for today I'm walking with an extra giddy-up in my step knowing that Marty and I are seeing rooster-claw-to-rooster-claw on this thing. I'm with Bill. Who cares?